3D displays are, let’s face it, sort of blah. We don’t love putting on dumb glasses just to get a headache from the mediocre 3D effects. The SplashDisplay created by University of Electro-Communications PhD candidate Yasushi Matoba is a much more exciting kind of 3D display. 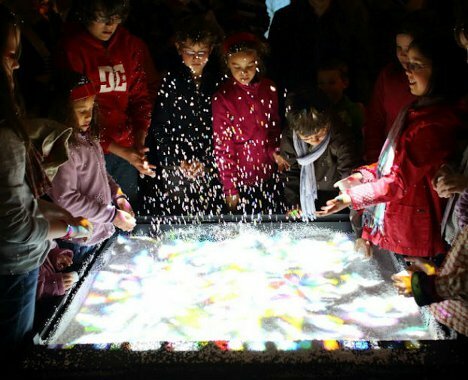 It incorporates a ton of lightweight white beads (think those obnoxious beads that go all over the place when you break up a piece of Styrofoam) to create “explosion”-type effects that jump right out at the viewer. The display is set up on a small, low table. Beads fill the recessed top of the table and projectors beam images and colors from multiple directions. Blowers made from speakers sit below the surface of the table to create air bursts that send the beads flying up into the air. The colored explosions look a lot like fireworks bursting up into space. 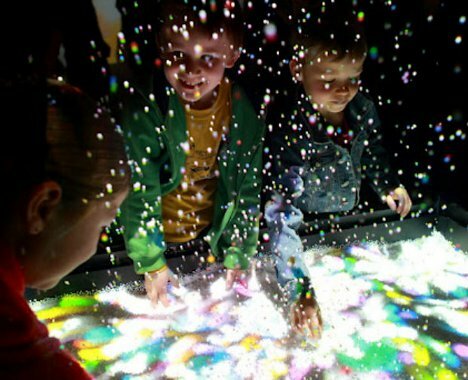 The SplashDisplay is also interactive, allowing users to play with the moving images. The video shows viewers playing a game on the display, throwing small objects at an alien invader to destroy it. When the ammo hits the alien, there is an “explosion” of little beads and the display lights up like crazy. The SplashDisplay definitely isn’t your standard 3D viewing platform, and we think that’s pretty rad.